Traditionally there have been just two ways to increase your speed on a unicycle: you could get a bigger wheel, or you could pedal faster. Now there is a third option. For more information on high-speed unicycling read Geared Unicycle Engineering Challenges and Riding Fast on One Wheel–Ignite Talk. Unicycles are like fixies – there is a direct connection between the pedals and the wheel. The wheel and pedals cannot rotate independently, and being able to slow the wheel by applying back pressure to the pedals is crucial – it’s how you stay balanced. Most unicycles have a one-to-one connection between the pedals and the wheels, and this leads to the rule mentioned above – to go faster you must pedal faster, or buy a bigger wheel. Now, however, there exist multiple designs for geared unicycles, and one of these geared designs allows for switching between two gears on the fly. The biggest unicycle wheels in common usage have a 36 inch diameter. With this size of unicycle a single pedal revolution will take you about 9.4 feet. More usefully, if you pedal with a cadence of 100 rpm you will go 10.7 mph. There are a few unicycles with 43 inch wheels and other large sizes but they start to become impractical. 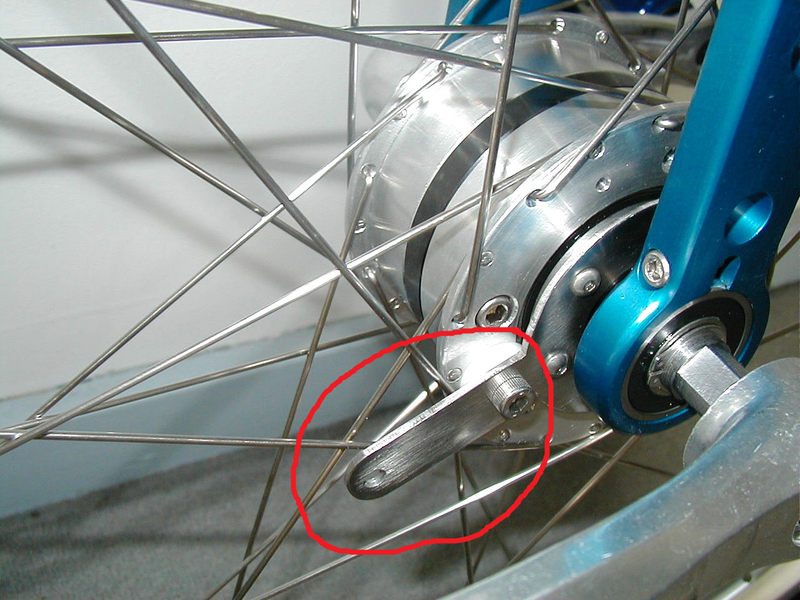 Since the pedals are mounted on the wheel’s axis a large wheel requires long legs. Large wheels also get heavier, or are made of unpleasant solid-rubber in order to keep the weight under control. A 43 inch wheel gives less than a 20% increase in speed at the same cadence, and it rarely seems worth it. A 36 inch wheel seems to be the sweet spot. Lance Armstrong is famous for having a high cadence. Whereas most professional cyclists pedal around 90 rpm, and recreational cyclists are typically slower, he sustains rates of about 110 rpm. However unicyclists think that Lance pedals slowly. My top speed on a 36” wheel is 17.2 mph, which requires a cadence of about 160 rpm. 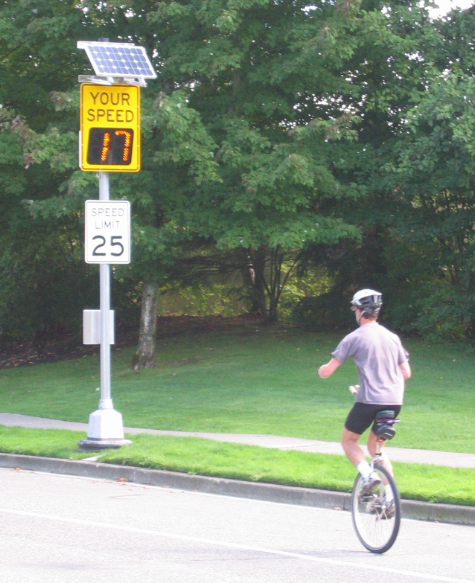 Better unicyclists than I have gone much higher – apparently up around 270 rpm (~29 mph on a 36” wheel). Bicycle cranks tend to be long – typically 165 mm or 170 mm – presumably from years of research into the most efficient length. However when you have one gear and it’s not a high gear the tradeoffs are different, so high-speed unicyclists ride on much shorter cranks, to facilitate faster spinning. My maximum speed on a 36” wheel was done with 125 mm cranks, but other riders go down to about 100 mm. When you hit the limits of wheel size and pedaling fast the next logical step is to add gears. The simplest way to gear up a unicycle is to take a ‘giraffe’ unicycle – one with the pedals above the tire and a chain drive going down to the axle – and put a larger chain ring at the top than at the bottom. 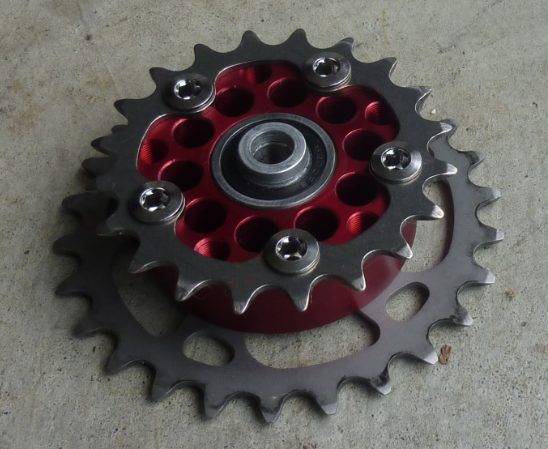 You can get any gear ratio you want this way. You can’t change gears on the fly – derailleurs don’t work on unicycles – but that’s okay. 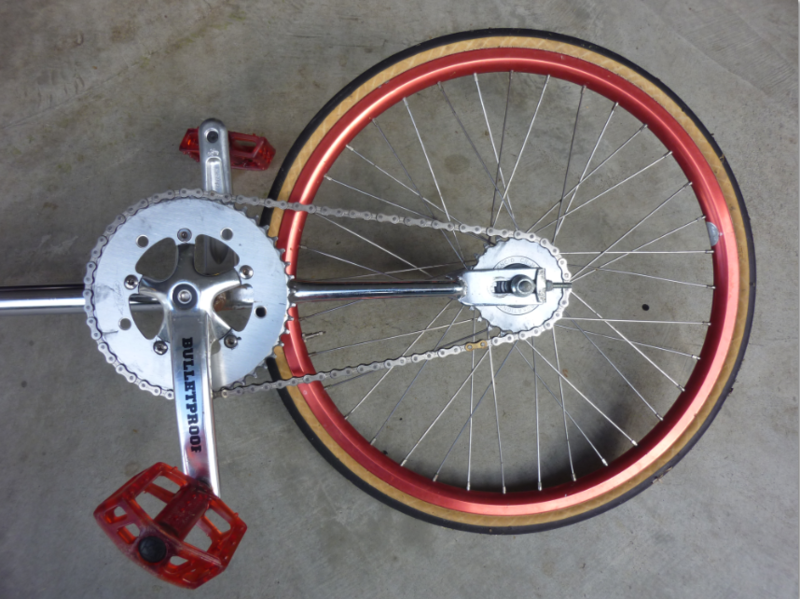 The unicycle shown in these pictures has a twenty inch wheel with exactly twice as many teeth on the top gear as on the bottom, making it equivalent to a forty inch wheel. The biggest limitation is that you are sitting up fairly high. This means the entire assembly weighs more and the chain is long enough that it will inevitably be a bit loose. But, within reason this can work. The unicycle in the pictures is a “Penguin Giraffe” made by Abram Clark. Its small wheel is not particularly safe when it meets bumps and rocks in the road, but it can go over 15 mph. I used it once in a twenty kilometer road race against riders on more ‘normal’ racing unicycles. I didn’t win, but I wasn’t last, and I enjoyed the delicious absurdity of it. You can see my over-produced Penguin Giraffe video on youtube. Using a system of planetary gears it is possible to put a tiny transmission inside the hub of a wheel. Making such a hub work in a unicycle is complicated by the need for full back pressure. 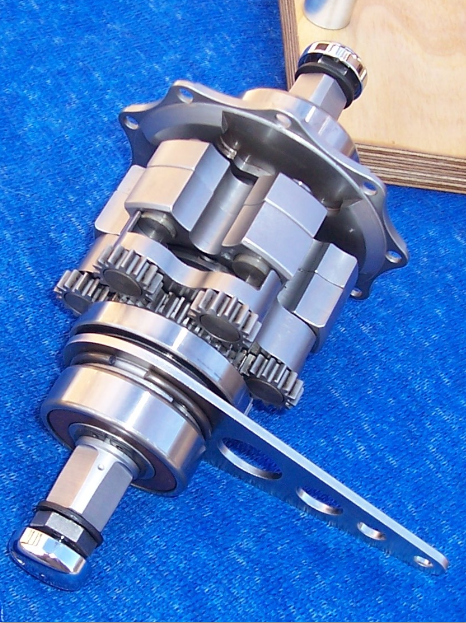 An early version by Greg Harper had a 1.5:1 gear ratio and could not be shifted. Greg then created a hub that could be shifted with about a minute of work with tools and put it in a unicycle he called Blue Shift, pictured at right. By locking the arm (circled in red) to the hub or to the frame you could switch between 1:1 or 1.5:1. It was the beginning of the geared age. Then, Florian Schlumpf commercialized a variation of this that could be shifted on the fly. With this hub you can shift up with a click of one heel, and shift down with a click of the other, while riding. In the picture to the right you can see the planetary gears, sun gear, and some tricky mechanisms to allow shifting on the fly. In the picture below you can see the hub – big enough to contain the planetary gear system – and one of the shifting knobs, and the dual drilled cranks to allow bonus flexibility in crank length. I was lucky enough to get to test drive all of these planetary gear unicycles, and I did eventually purchase a Schlumpf hub in a 29” unicycle. A final option for gearing up was developed by Pete Perron. In this system the crank shaft goes through the drive shaft but they rotate independently. Power is transferred through a set of four cogs and two chains – up from the pedals to a jackshaft, then down to the drive shaft. Unlike a geared hub, you can get virtually any gear ratio you want, and unlike a single chain design there is very little extra weight and no extra height. 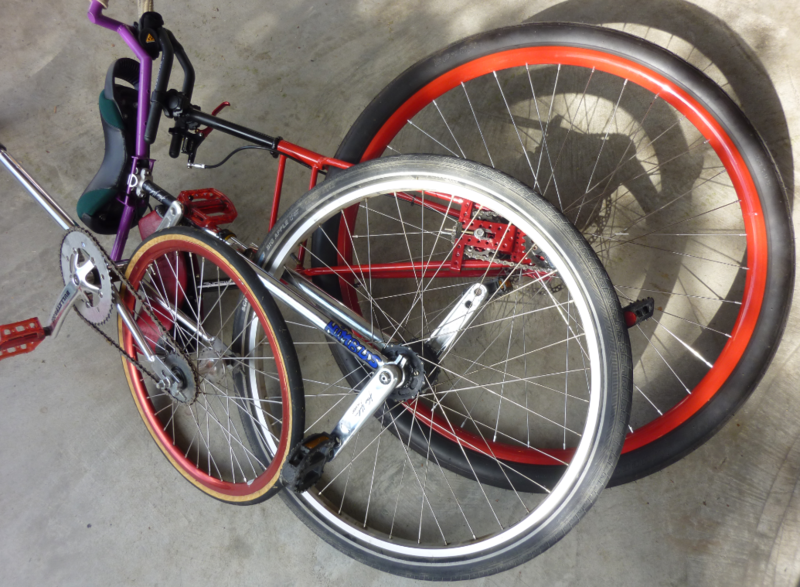 Pete made two versions of this, both with 36” wheels, and I just purchased the second one, named Red Menace. In the picture below you can see the short chains going from the cranks, up to the jackshaft, and then back down to the axle. You can also gear it down, or do other more creative ratios. My top speed to date is using the 1.44:1 gear ratio and 170 mm cranks to get up to 20.6 mph. It’s definitely exciting when you start losing your balance on one wheel at a higher speed than you can run. So far I have had no high-speed falls (nothing over 15 mph), but pushing the limits does come with risks. It’s also cool/scary to think that with some changes to gearing I should be able to go significantly faster. 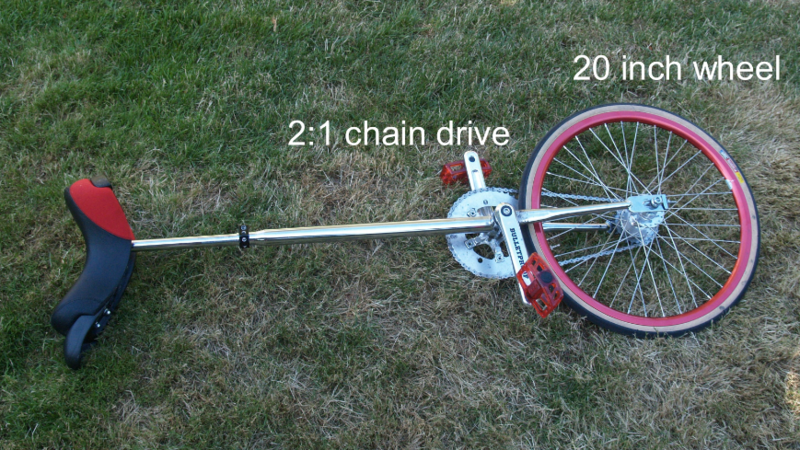 It turns out that the forces involved in a dual chain-drive unicycle are quite extreme – I wrote about those forces in Geared Unicycle Engineering Challenges, where I tell the sad story of almost breaking my dual-chain unicycle while changing gears. Riding a unicycle is, like walking, a constant state of near falling.The rider needs to perform tiny adjustments many times per second in order to keep the center of support directly underneath the rider’s center of mass. If you start falling forwards then you need to instantly pedal faster. If you start falling backwards then you need to instantly push back on the pedals. These corrections are happening multiple times per second, usually without the rider even noticing. It’s only when the corrections almost don’t work that the unicycle perceptibly moves from the vertical and the rider’s heart rate goes up a bit. The derailleurs which are used for gearing on bikes don’t let you apply back pressure. If you pedal backwards you freewheel, and if you stopped the axle from freewheeling then pedaling backwards would just damage the gearing system. It is possible to ride a unicycle without being able to pedal backwards – doing a wheelie on a bike that freewheels proves this – but it is not stable, and it doesn’t work downhill. Technically it is possible to use a brake as a substitute for pedaling backwards, and anybody who thinks that that is a good idea is welcome to try it. The challenge in unicycling is the front/back balance. The left/right balance is similar to the challenge of riding a bike with no hands – easy once you are used to it, and rarely the source of exciting falls. About the closest thing to a rational explanation for why I unicycle is that it is an inefficient form of transportation (less efficient than a bike, but more efficient than walking or running) and is therefore great exercise. And a fun challenge. And because improving my balance skills lets me try cool toys. And because it is there. And because owning three of the coolest geared unicycles in the world (shown together below) is still much cheaper than buying fancy cars or smart-phones. While my top speeds have been set on geared unicycles, my longest ride ever was done on an ungeared 36” unicycle. I rode the Seattle to Portland Bicycle Classic on a unicycle, covering 204 miles in two days. Some day I’ll do that again on a geared unicycle, which should make it a bit faster. Apologies for the mixture of metric and imperial units. For more information read Geared Unicycle Engineering Challenges and Riding Fast on One Wheel–Ignite Talk. Or look at the complete series. This entry was posted in Unicycling and tagged geared unicycles, giraffe, one wheel, penguine giraffe, stp, unicycles, unicycling. Bookmark the permalink. Do you know Huni-Rex unicycle? We think it’s a workable geared unicycle, with 26″ wheel, but with good parameters. I had not heard about Huni-Rex. It looks interesting. What sort of clearance is there from the pedals to the ground? Definitely send me pictures. Although really what I want you to do is bring over a prototype so I can test drive it. I’m an accomplished test pilot of geared unicycles. I followed this thread as have designed and built a 21 speed through hub drive,which at the moment freewheels and is being fitted into a full speed penny farthing type recumbent but could easily be modified not to, so that you could choose any of the ratios available,not changeable while riding. Would you like test Huni-Rex also :)? To find a solution – if it interesting to you, send an email: info@huni-rex.hu. A foot of snow might be a bit much, but I’ve had great fun riding my muni in about six inches of snow. When the conditions are right it can be glorious. hey bruce, just wondering can you unicycle and juggle at the same time? I can do both but not at the same time. I’m making progress on the three speed, should get to starting the frame next week hopefully, should have a twenty six inch wheel from a mountain bike so with the gearing I’m hoping to do I should have maybe a bit over 1 to one on the final drive up to better than two to one, I have my sights set on the land speed record for one wheel which I think is 26 mph on a 48 inch wheel back in the nineties I believe.Just not me doing it because I still have to go to work every day.Our snow finally started to melt here where I live in beautifull deadman valley. The fastest reported ungeared speed is now 29ish mph, and the fastest geared speed is 33.0 mph. Intimidating. See post #460 in this thread. And yes I can unicycle and juggle at the same time, although I usually only do that on smaller unicycles. It’s very popular at parades, especially if you ‘drop’ a club and then pick it up while riding. Years ago, when I was just getting going juggling and unicyclying, a Quebec busker came thru town with the Buskers Festival (back when it was run by crooks and rocked; before the government took over, cleaned it up, and crushed the life out of it). He spent half an afternoon with me, and taught me more about juggling on the uni than I’d managed in several months effort. First, do arm independence exercises. Ride with your arms wrapped around your chest, over your head, firmly at your sides, straight out doing arm circles, etc. Make sure that you aren’t using your arms at all for balance. Only when you can balance independent of what your arms are doing shouldb you try to juggle. Watching an expert unicyclist use a brake is an amazing thing. A gentle force is the most common way to use it — to make going down long hills better — but some riders can take their feet of the pedals and use the brake to come to a very abrupt stop. I need more practice before I can safely use a brake. Thanks for posting this info 🙂 I purchased a folding bike a couple years ago, a BikeFriday, and I love it. I bought it for the occasional commute on buses, trains, and planes; and for Burning Man 😉 Last night, I was walking down the platform with my bike awaiting a train and I saw a unicyclist. I started chatting him up and he told me about geared unicycles. I think a geared unicycle might be easier for public transportation than a folding bike. 1. Which relatively compact geared unicycles would you recommend for public transportation? unicycle.com sells unicycles, and unicyclist.com discusses them. Beyond that I’m not sure — my blog might contain the majority of articles posted on this topic. I would never suggest getting a unicycle for a practical reason (“easier for public transportation”) — do it because it’s fun, challenging, good exercise, and if it works well that’s a bonus. I want to buy a geared unicycle please can you help? I want a price list or contact details so that i can get one. The only commercially available geared unicycles I am aware of are Huni-Rex and the Sclumpf hubs. You should be able to find both of these through web searches. I think the derailleur system could work if you lock the hub to the wheel and add a second “entry set” of chain guides so that the chain had the correct sprocket entry position guides regardless of the wheel direction. Part of what a derailleur system does is to let the length of the return chain vary to accommodate different sized sprockets. That seems incompatible with supplying power by pedaling backwards. If the system doesn’t freewheel then you will initially just pull the tension gears and you’ll hit the ground (falling off the back) before the slack is pulled in. The effect you describe is common. Once the gear ratio is very high the back-pressure on the pedal when mounting may be insufficient to hold the wheel in place. The problem is exacerbated if the seat is high relative to the rider’s height. The trick is to do a static mount or rolling mount. 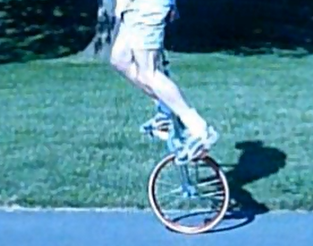 As long as the unicycle is near vertical it will be possible to hold the wheel in place, and a static mount or rolling mount implies that the rider jumps on so that the unicycle is near vertical right away. See my giraffe video for an example of mounting a 2:1 20″ giraffe. Mounting by holding on to an overhead beam may also work. Once you are riding the problem is ‘just’ that the balance envelope is very small, but skilled riders can handle amazingly high gear ratios with very short cranks. Where can I purchase the dual chain unicycle? I can’t find it anywhere. Sorry, the dual chain unicycle it was custom made. I bought it from the creator. Hi, Bruce. I’m curious about your comment that you still use 36″ for distance. Why not a smaller geared uni? It is just an accident of history that my longest ride was not on my fastest unicycle. 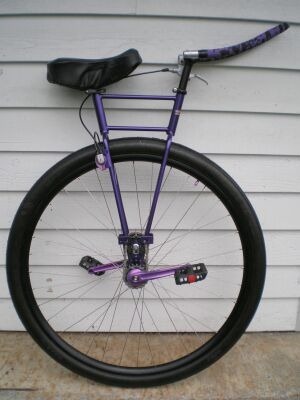 A geared 29″ unicycle would probably be my best choice for future distance records, if I attempt any. The only proviso would be that the simplicity of an ungeared 36″ makes it more reliable – most of my geared unicycles are having mechanical problems at the moment.